If you have not lived at the previously provided address for the past 3 years, please provide other addresses below. If you answered “yes” to any of the above questions, please give details. Please include your most recent driving experiences, up to two. Please include your most recent accident records, up to three. Please include your most recent traffic convictions, up to three. Yes, I have tested positive or refused a test for drugs/alcohol in the past three years. No, I have not tested positive or refused a test for drugs/alcohol in the past three years. 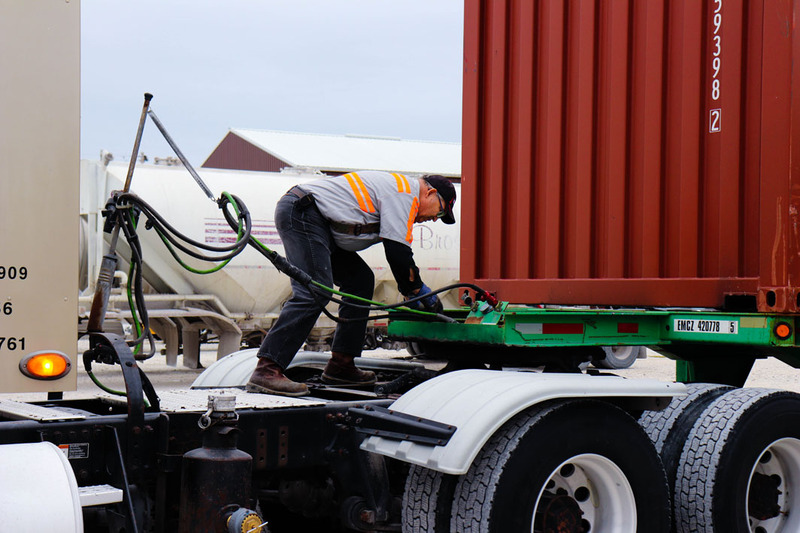 DOT regulations prohibit our utilizing you to perform a “safety-sensitive function” (driving a commercial motor vehicle) if you had a positive test, or a refusal to test, until and unless you provide documents showing successful completion of the return – to –duty process in accordance with DOT regulations. As required by Rollet Bros. Trucking Co., Inc, I understand that all prospective drivers must submit to controlled substance testing involving collection of a urine sample that will be tested for controlled substances. This certifies that this application was completed by me, and that all entries on it and information in it are true and complete to the best of my knowledge. I understand that my employment may be immediately terminated if it is later learned that any entry on this application is untrue or incomplete. Motor carriers have the responsibility to make the following investigations and inquiries with respect to each driver employed, other than a person who has been regularly employed driver of the motor carrier for a continuous period which began before January 1, 1971. (a)	(2) An investigation of the driver's employment record during the preceding three year. (b)	(b) A copy of the driver's record(s) obtained in response to the inquiry or inquiries to each state driver record agency as required must be placed in the driver qualification file to each state driver's employment begins and be retained in compliance with 391.51. (c)	Replies to the investigations of the driver's safety performance history must be placed in the driver investigation history file within 30 days of the date the driver's employment begins. This goes into effect after October 29, 2004. (d)	Prospective motor carrier must investigate the information from all previous employers of the applicant that employed the driver to operate a CMV within the previous three years. This information must cover general driver identification and employment verification information, data elements as specified in 390.15 for accident involving the driver that occurred in the three year period preceding the date of the employment application, and any accidents the previous employer may wish to provide. (e)	Prospective motor carrier must investigate the information from all previous DOT regulated employers that employed the driver within the previous three years from the date of the employment application in a safety-sensitive function that required alcohol and controlled substance testing specified by 49 CFR Part 40. Drivers who wish to review previous employer-provided investigative information must submit a written request to the prospective employer when applying or as late as 30 days after employed or being notified of denial of employment. The prospective employer must produce this information to the applicant within five business days of receiving the written request. If the driver has not arranged to pick up or receive the request records within 30 days of the prospective employer making them available, the prospective motor carrier may consider the driver to have waived his/her request to review the records. Drivers wishing to request correction of erroneous information in record must send the request for the correction to the previous employer that provided the records. After October 29,2004 the previous employer must either correct and forward the information to the perspective motor carrier employer or notify the driver within 15 days of receiving the driver's request to correct the data that it does not agree with correct the data. Drivers wishing to rebut information in records must send the rebuttal to the previous employer with instructions to include the rebuttal in the driver's safety performance history. I acknowledge that I have read and understand the contents for this document. In connection with your application for employment with Rollet Bros Trucking Co, Inc. (“Prospective Employer”), Prospective Employer, its employees, agents or contractors may obtain one or more reports regarding your driving, and safety inspection history from the Federal Motor Carrier Safety Administration (FMCSA). When the application for employment is submitted in person, if the Prospective Employer uses any information it obtains from FMCSA in a decision to not hire you or to make any other adverse employment decision regarding you, the Prospective Employer will provide you with a copy of the report upon which its decision was based and a written summary of your rights under the Fair Credit Reporting Act before taking any final adverse action. If any final adverse action is taken against you based upon your driving history or safety report, the Prospective Employer will notify you that the action has been taken and that the action was based in part or in whole on this report. When the application for employment is submitted by mail, telephone, computer, or other similar means, if the Prospective Employer uses any information it obtains from FMCSA in a decision to not hire you or to make any other adverse employment decision regarding you, the Prospective Employer must provide you within three business days of taking adverse action oral, written or electronic notification: that adverse action has been taken based in whole or in part on information obtained from FMCSA; the name, address, and the toll free telephone number of FMCSA; that the FMCSA did not make the decision to take the adverse action and is unable to provide you the specific reasons why the adverse action was taken; and that you may, upon providing proper identification, request a free copy of the report and may dispute with the FMCSA the accuracy or completeness of any information or report. If you request a copy of a driver record from the Prospective Employer who procured the report, then, within 3 business days of receiving your request, together with proper identification, the Prospective Employer must send or provide to you a copy of your report and a summary of your rights under the Fair Credit Reporting Act. Neither the Prospective Employer nor the FMCSA contractor supplying the crash and safety information has the capability to correct any safety data that appears to be incorrect. You may challenge the accuracy of the data by submitting a request to https://dataqs.fmcsa.dot.gov. If you challenge crash or inspection information reported by a State, FMCSA cannot change or correct this data. Your request will be forwarded by the DataQs system to the appropriate State for adjudication. Any crash or inspection in which you were involved will display on your PSP report. Since the PSP report does not report, or assign, or imply fault, it will include all Commercial Motor Vehicle (CMV) crashes where you were a driver or co-driver and where those crashes were reported to FMCSA, regardless of fault. Similarly, all inspections, with or without violations, appear on the PSP report. State citations associated with Federal Motor Carrier Safety Regulations (FMCSR) violations that have been adjudicated by a court of law will also appear, and remain, on a PSP report. The Prospective Employer cannot obtain background reports from FMCSA without your authorization. In connection with my application for employment (including contract for services) with you, I understand that consumer reports, which may contain public record information, may be requested from HireRight (formerly USIS or DAC Services), Tulsa, OK. These reports may include the following types of information: names & dates of previous employers, reason of termination of employment, work experience, accidents, etc. I further understand that such reports may contain public record information concerning my driving record, workers' compensation claims, credit, bankruptcy proceeding, criminal records, etc., from federal, state and other agencies, which maintain such records; as well as information from HireRight concerning previous driving record requests made other from such state agencies, and state provided driving records. I AUTHORIZE, WITHOUT RESERVATION, ANY PARTY OR AGENCY CONTACTED BY HIRERIGHT TO FURNISH THE ABOVE MENTIONED INFORMATION. I have the right to make a request to HireRight, upon proper identification, to request the nature and substance of all information in its files on me at the time of my request including the sources of information & the recipients of any reports on me which HireRight has previously furnished within the two year period preceding my request. I hereby authorize procurement of consumer reports(s). If hired (or contracted), this authorization shall remain on file and shall service as ongoing authorization for you to procure consumer reports at any time during my employment (or contract) period. I have read the above Notices Regarding Background Reports provided to me & I understand that if I sign this consent form, Rollet Bros may obtain a report of my crash & inspection history. I hereby authorize Rollet Bros & its employees, authorized agents, and/or affiliates to obtain the information above.